Ketamine Consulting has helped ketamine clinics across the country to open their doors, become fully-operational, and fill their treatment rooms with patients. Our unique and integrated approach to operations and marketing enables our clients to run successful businesses and successfully compete with other clinics in their area. In Washington State, South Sound Health & Wellness has built a successful ketamine clinic treating patients from the Tacoma, Seattle and Olympia areas. 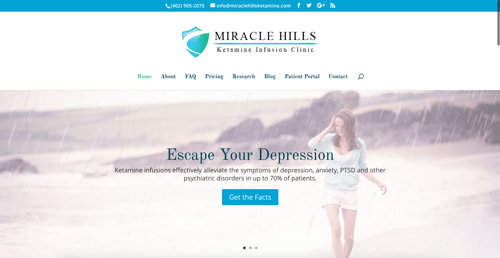 With a successful physical medicine practice already in operation, we helped Miracle Hills Clinic expand their operations to include ketamine infusions for depression & chronic pain. This Charlotte-area ketamine clinic also offers a full menu of wellness services, such as IV Hydration Therapy, to help clients with all aspects of their health and wellbeing. After several successful months of operation, RestoratIV Wellness has become a leading ketamine clinic in southern New Jersey and the greater Philadelphia area. We customized a robust and highly functional website for Virginia Infusion Therapies, taking advantage of the opportunity to capitalize on search engine trends in the Virginia area. Ascend Ketamine operates in the greater Houston area. After several months of consistent marketing efforts, Ascend grew to dominate local search results and build a highly successful ketamine clinic, emerging as a leader in Houston and beyond. Lake Tahoe has a new ketamine clinic, and with an eye-catching site rich with information about ketamine and IV hydration infusions, they’re ready to own their industry. With three locations in the Midwest, Interpersonal Advanced Treatment is leaning on both its stellar reputation as a psychiatric practice and our experience launching successful ketamine clinics. In Northwest Arkansas, this ketamine clinic focuses on ketamine for depression and other psychiatric disorders, leveraging the founder’s primary area of practice.